A wedding is a lifetime commitment; an exchange of vows; a bonding of families, a new beginning. It is a parent’s lifelong vision for their children and also a couple’s stepping-stone to a new life, new promises and their dreams. Planning a wedding however comes with a lot of stress, innumerous coordination, intense anxiety and a planning process that is very time consuming. Traditionally a wedding involved the support and input of the family and extended family members, keeping in mind the family traditions. Today, families have become more nuclear and more widespread. Brides and grooms are opting for newer ideas, interesting and novel concepts and new formats of styling a wedding. Latest entertainment ideas, innovative designs, trendy couture, varied cuisines, hi-tech decorations have become the vogue and nuance of today’s weddings. With the service and support of a professional wedding planner it is now possible to conduct lavish weddings, without the added stress. Venue location/Identification including hotels, wedding halls as desired by the family. To take a couple’s vision and dream and turn it into reality without the added stress, by handling all the activities related to the wedding. To come up with innovative concepts, creative ideas and designs that work towards exceeding our client’s expectation. To work hard and leave all the details to us so that the family can relax and enjoy the wedding ceremonies. To source and to coordinate with the best vendors for our clients, using our experience and our contacts in the industry and not let them worry about looking for the right people for the wedding. To work with our clients in setting timelines and budgets so that we make the wedding a very successful event and help create that special memory for their family. 1) How do I identify a good wedding planner? The wedding day is one of the most important days in a person’s life in any culture around the globe. A good wedding planner is one who is sensitive towards the needs of your family, understands your vision and has the ability to convert that vision into a dream come true event for you. They should have adequate resources at their disposal, the connections with the finest and most reliable vendors and the most hard working team whose main goal is to keep the event memorable for the families involved. Most importantly the family should feel extremely comfortable with the wedding planner and find the trust and confidence in them to conduct the events that are so personal to them. A good wedding planner is one who is sensitive towards these emotions and can work towards creating those lifelong memories by making the whole process seamless and stress free for the family. 2) What kind of packages do you offer? Our involvement with the families is on a very personal basis. We do not offer packages because we feel every family’s requirement is unique and special. Therefore after understanding their needs we create a customized plan that works for them. We would much rather ask our clients what they need from us than hand them a predetermined check-list of services that leaves them with limited choices. 3) What responsibility would you take up? We can take as much or as little responsibility as desired by our clients. Our expertise and experience lies in conducting every aspect of the wedding. 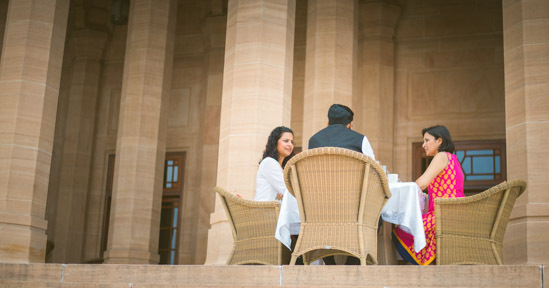 From offering delectable cuisine to choosing spectacular venues or creating enthralling entertainment to designing stunning stage and floral decorations or taking impressive video and photography to mood photography, we can effortlessly lead our clients through the entire array of services that makes a wedding a resounding success. 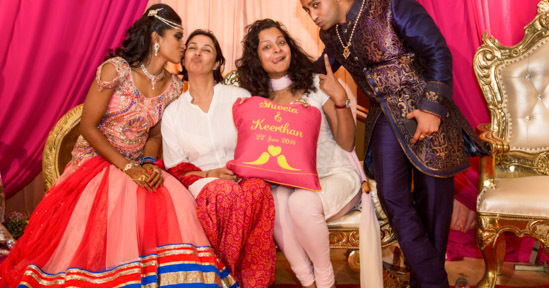 4) Do you conduct only traditional Indian weddings? We believe each wedding is unique and so we always customize the wedding according to the customs and needs of the families involved. We do plan and coordinate all types of wedding and wedding related events like engagement ceremony, sangeet (music), mehndi, and reception. We organize weddings of all faiths and cultures including Hindu, Church weddings, Nikah etc. 5) How do you keep up with the changing trends? Our most important motivation in researching the trends of the wedding industry comes with our desire to exceed the expectations of our clients. Our team works very hard in keeping abreast of the latest trends by regularly staying in touch with the changing markets; shadowing the changes in fashion, styling, entertainment, technology, make up and all aspects of a modern wedding. 6) Do you work with preferred vendors or do comparison-shopping? The requirement of every wedding is reflective of their family customs and traditions. Hence we plan our vendor selections based on those needs. Our industry wide contacts come in handy during this time and comparison-shopping in the best interest of our clients is conducted. 7) If I have hired the vendors do I still need a wedding planner? Hiring vendors is just one part of the wedding and having a vendor arriving on time and in the right attire is a greater challenge. There are many aspects of a wedding that need attention. Having a single point of coordination with every aspect of the wedding makes the whole process smooth and tension free. A wedding planner can do just that. 8 ) Do you help in the budgeting process? While we help our clients understand the costs involved in engaging in different wedding activities, we respect the budget the family has and work with them to keep the costs under control. 9) At what stage do you get involved? Ideally we should be involved from the very first stage of planning a wedding. It makes the coordination and control of all activities more seamless. However we have also been involved in the midst of the planned wedding and can be as helpful to our clients. We help families from the time of the engagement ceremony to creating invitations, designing stage & decorations, helping the bride with her make up and couture selection, sangeet, mehandi, addressing special traditional customs, guest handling, logistics, catering, video and photography, honeymoon travels and any special requirements the bride and groom may have to make their dream day special. 10) How do you charge for your services? Since we create only customized plans based on each family’s unique requirement, our fees also depend entirely on that. We strive to give our best services at the highest value to our clients. 11) What makes you different from others? Our involvement with the family and being their friend, guide and leading hand during a very stressful but very important milestone of their life is our highest reward. For us this is not just a job but also a commitment in making dreams come true. We have a very hard working team and reliable vendor connections that make us strive for the flawless execution of the wedding with the sole purpose of fulfilling your dreams. 12) Do you help finding the venue for the wedding and reception especially for overseas clients? Yes we most certainly do and have in the past conducted weddings for overseas clients. 13) Do you help designing personal wedding web sites? Yes we have helped our clients in the past in creating and recording a memory of a personal wedding web site. 14) Are you available on site at the day of the wedding? 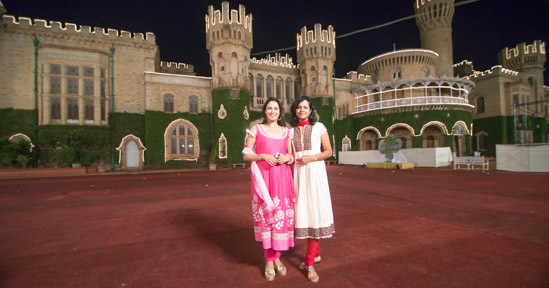 Both Divya and Vithika along with their well-trained team are available throughout the course of the wedding. 15) What activities are you involved in Pre-wedding planning? We can be involved in all aspects of pre-wedding planning including pre-wedding grooming and engagement ceremony, designing, printing and distribution of invitation cards, conducting family dinners, music and dance including choreography, trousseau sourcing and selection to bridal wear. Today couples opt to consult unconventional but much needed experts like image consultants, pre-marital counselors, dental cosmetics experts, makeup artists, yoga and fitness experts, dieticians and nutritionists and we connect them to our clients as well. The most important aspect of engaging a wedding planner is to seek someone with whom the bride and the groom are comfortable to share their dreams and their vision. For this purpose it is important for them to prepare and discuss a set of questions and concerns right away with the wedding planner. 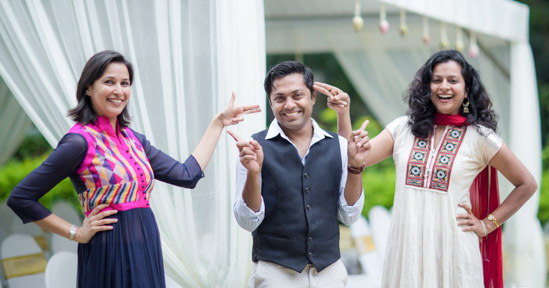 Coming up with clear goals helps in creating all the wedding events more productively. The wedding planner will meet you at different stages of the planning, get to know you better and eventually will become our voice and leading hand for your dreams. They will be able to set clear timelines and help you with the budgeting process. For this purpose transparency about budgets, expectations and concerns is absolutely necessary to create mutual understanding between the wedding planner and the families. Be open and honest about your budget, timelines and expectations in terms of the events and activities to be organized. A great wedding planner always has the best interest of their clients in mind. Having trust and confidence in them is absolutely necessary. Spend time with them so they understand your needs completely. Ask a lot of questions to gauge the capability of the wedding planner in terms of their connections and relationships with vendors, ability to deal with timelines and budgets, how seasoned they are and how they can deal with crisis situations, their previous work and about their team.